Too often when presenting services we lack the ability to leverage the offering as we are not offering a commodity, a tangible good. How can we best convey the features and benefits associated with the work we do as a CPA, EA, accountant, bookkeeper, tax preparer, QuickBooks Specialist, payroll specialist, etc? A tool that can be key to make that difference is a visual representation of your credentials, your goals and the services you offer. 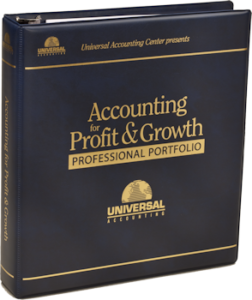 For this reason Universal Accounting as created a customizable portfolio that can be used when meeting with potential clients to help you present with confidence the services you offer so that they can see you as their Profit and Growth Expert. Use it as an outline for your presentation, practice with it and you too can also have the polished presentation that you are hoping for. Getting new clients closed is a matter of saying the right thing in the right way. 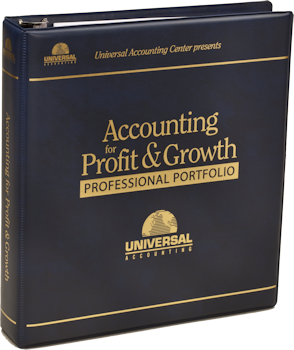 This Presentation and Demo Book includes the visual presentation taught in our Universal Practice Builder Course and provides a very professional display, as well as sample financial statements from the sample clients included in the Professional Bookkeeper Certification Course. With the professional 3-Ring binder you will make a great impression in your sales presentation. Slip in some monthly fee calculations form, and some scope of services agreements and you’ve got everything you need to walk in, give a powerful presentation, and walk out with a new client. Power up your sales ability with this proven tool. When working with businesses it is common to help them address their cash flow needs. Part of this process may be helping them improve or even secure a line of credit. Part of this may include helping them identify and fix credit related issues. 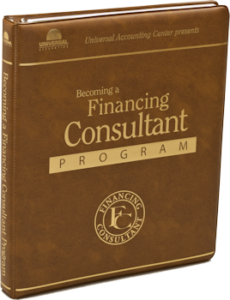 As a Profit and Growth Expert for your clients it would be best that you also work with them as a Financing Consultant. The e-book comes with a zip file containing 11 helpful forms in developing a loan application form. Just load the file into any word processing program and you’re ready to go. 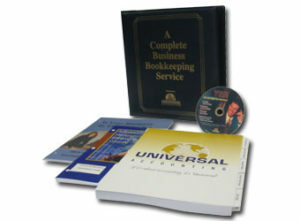 Speak with an Enrollment Representative with Universal Accounting to get started today: 800-343-4827. Great job. I enjoyed the DVD set and information. Thank You.